Have you heard? 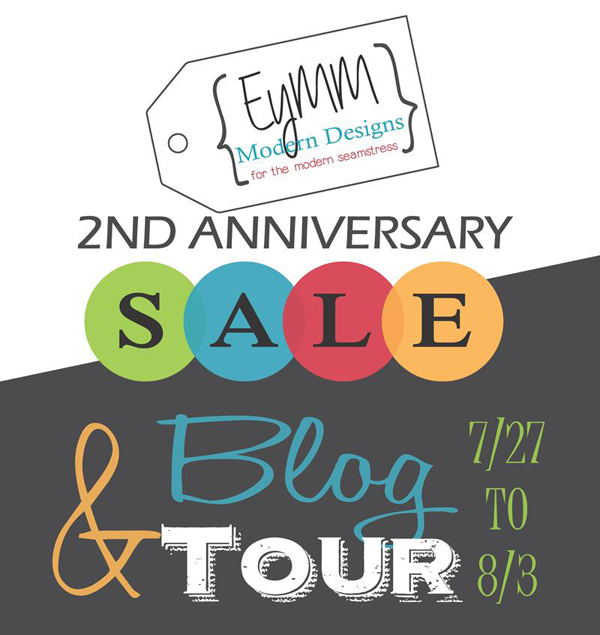 Everything Your Moma Made & More is celebrating 2 years! This is my first time participating in a blog tour and I’m so excited to be part of this one. 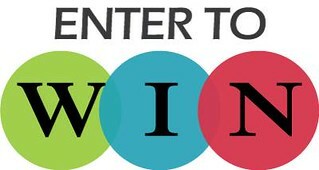 Check out the end of this post for a link to all the blogs on tour, a discount code, and a chance to win some fabulous prizes! EYMM has some fantastic patterns and I’ve loved everything I’ve made from them. EYMM’s Piko Top was the first pattern I purchased for myself. And their every day essentials pattern has been used for some of my favorite night gowns. 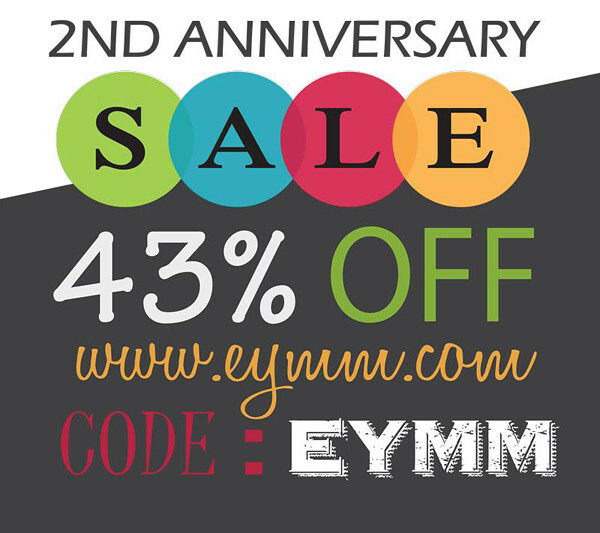 But today I’m going to show some of my recent projects from EYMM. 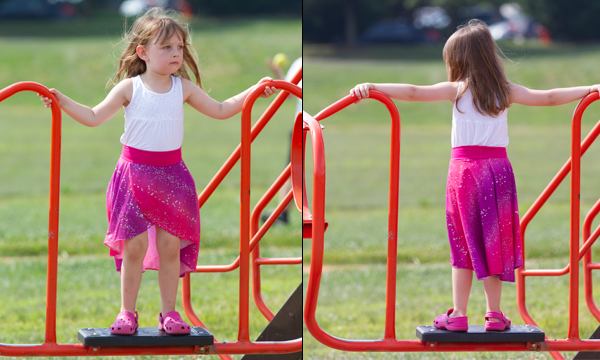 First up is the Calla Lily Skort pattern for girls. 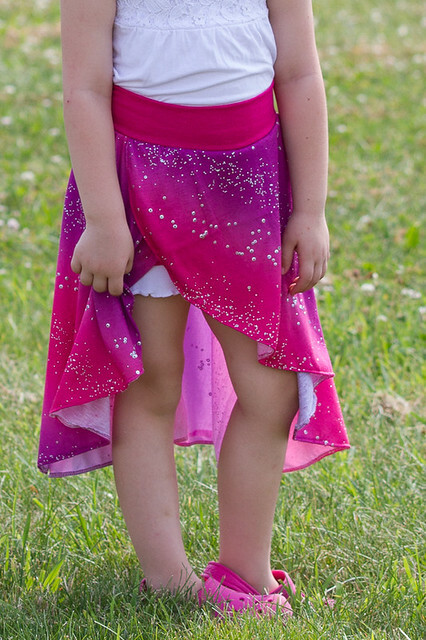 This was such a quick and easy sew (even more so when you leave off the shorts). The hardest part of this skirt was the fabric I used. Little Bit saw this fabric on a trip to Jo-Anns about 6 months ago and it’s been sitting in my stash wondering how to use it with all the sequins. It actually sewed up better than I was expecting, but the needle would shift left or right when it hit the sparkles. I left off the shorts portion as I thought this would be the perfect thing to thrown on over a Leotard after dance or gymnastics and can sill be worn with shorts underneath. Next up is the Four Seasons Cardigan and Duster pattern which like all the others in this post is available in women’s and kids sizes. Both Little Bit and I have a tendency to be cold in public spaces that have A/C blasting in the summer yet we both aren’t huge fans of long sleeves, so for both of us I opted for the 3/4 sleeves. I made mine in a light weight hacci sweater knit which should be the perfect weight for wearing around my office. 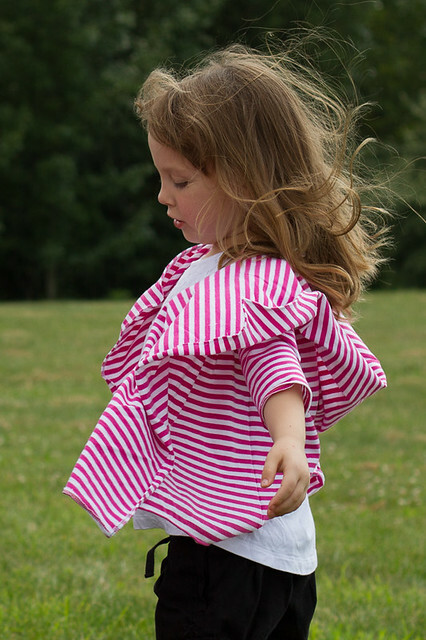 Little Bit’s is made out of a medium weight stripped knit that should warm her up nicely in cold spaces this summer and transition nicely into her wardrobe for fall. Hers I added a hood to because well, hood are fun. Lastly, is the newly released Capsule skirt. Which will probably become a staple in both of our wardrobes. It’s such an easy skirt to wear and has the bonus of having the option of hidden side seam pockets. 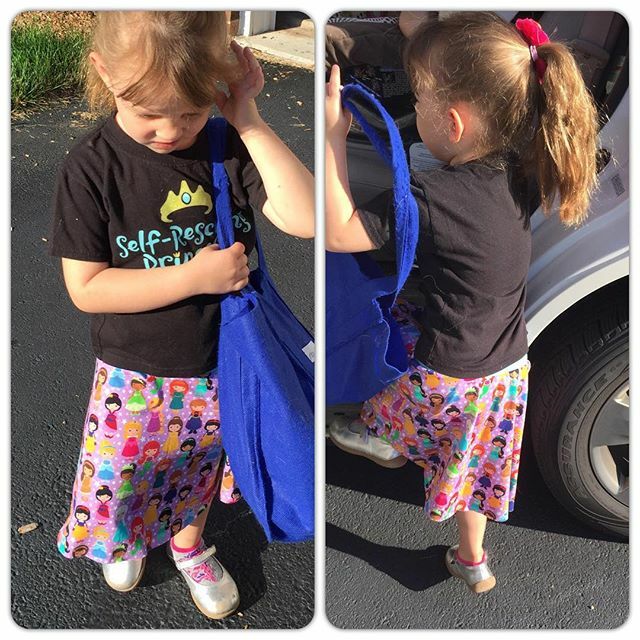 Little Bit had a Knights and Princess theme day at camp, so the night before I was able to whip up this skirt in less than an hour. I opted out of the pockets for this sew, but will definitely include them in the future. 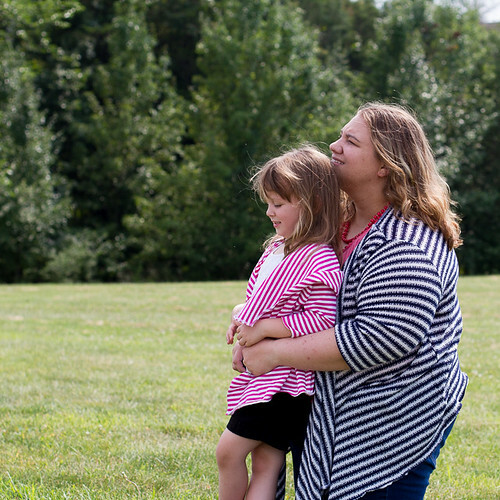 One of the things I love about EYMM patterns is the size range that is included — kids NB – 18 or women’s XS-5X, and they often have bundle pricing for those patterns available for both girls and women. The patterns go together easily and the results are fantastic. Happy Anniversary to Everything Your Mama Made & More! Thank you for including me in your blog tour. I love this skirt. It looks adorable on and I love the way it moves. This was the first time I worked with hacci and it was enough of a challenge for me to cut that I wasn’t even going to try for matching the stripes. It turned out to be easier than I was expecting and this is the perfect thing to grab when there is a chill in the air. The fabric for your Calla Lily is just amazing. I love it! I bet any little girl would. Love the stripes too of the four seasons. 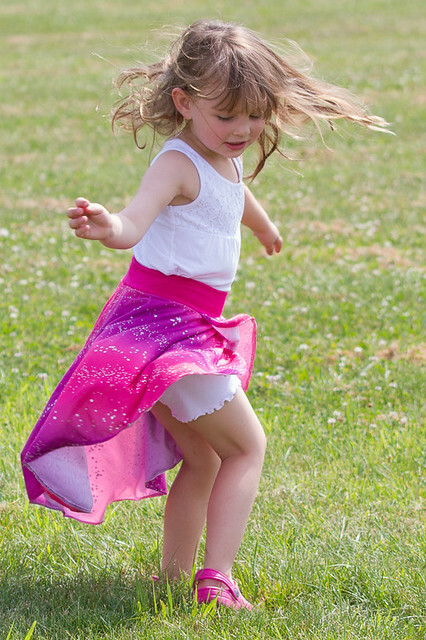 Your calla lily skirt is so cute on your little one. What little girl doesn’t love pink sparkles! I really would love to try the his and hers asymmetrical hoodie! The Cardigan would look good with The Calla Lily skirt. I would pick the Dolman Top. Have a great day! Cute, cute clothes. Iam hoping to win the the cardigan pattern!! Your cardigan looks great! I’ve been trying to decide what to do with that KnitFix fabric myself. I had so many ideas for that hacci. But I really like the way this turned out It’s so comfortable too. I absolutely love your cardigan! I would love to try that pattern! The four seasons cardigan is at the top of my long list of patterns I would like to try. 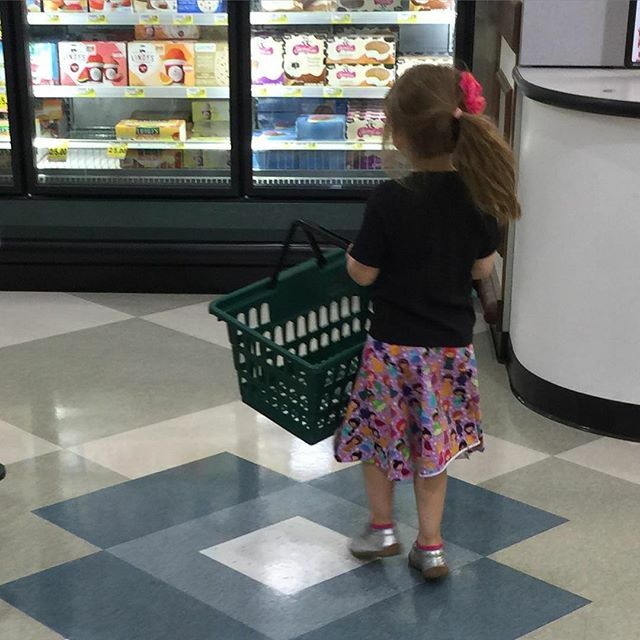 And that skirt is so cute. I love all your outfits! The fabrics are awesome and that cardigan looks sooooo cozy! I’d choose the Get Moving leggings so I can make myself some skorts! lovely cardigan and pretty capsule skirt… difficult choice! Carlie’s Dolman Top is my current favorite although your photos of the Calla Lily Skort have me loving that one too! Your daughter is darling in it! I’m crushing on that skirt. My daughter would really love it! I would like the everyday essentials set for myself. Love these! I would love the Dolman pattern! Love these outfits! The little Calla Lily skirts are darling. I would love to try the Harem pants next.